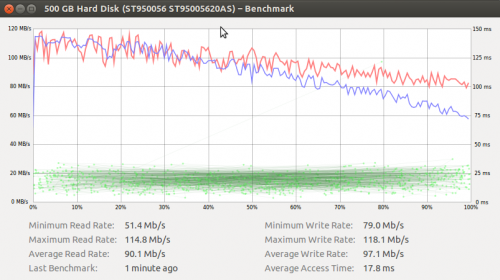 Read/Write speed of Seagate Momentus XT 500GB hybrid hard drive | Michael Hirsch, Ph.D. The Seagate Momentus XT 500GB hybrid hard drive (4GB SSD, 500GB HDD) is a useful way to speedup system boot and execution. However, on brand new files the speed is the same as a typical hard drive. I plugged the new drive into my Kingwin Dockmaster USB 3.0 adapter to see what the drive could do over a USB 3.0 link, using Disk Utility on Ubuntu 12.04.